If you're new to promotions, the timeline will give you a brief overview of the stages involved. The map illustrates our Tasmanian distribution zones, roll over each zone with your cursor and some basic info for that zone is displayed. Choose a package if you want to get your campaign up and rolling with minimal fuss or let us design a campaign for you. 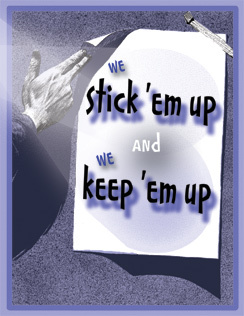 Stick 'em Up has been distributing and displaying posters, fliers, brochures and programs - into cafes, shops and businesses around Tasmania since 1997. We are the only truly professional service in the state that is purely focused on the Arts, Entertainment and Events arena. invented and pioneered professional arts, entertainment and events distribution in Tasmania and our wide ranging experience is unequaled. Small or large targeted campaign distributions are catered for and we can place upwards of 1200 posters and 1000 drops of fliers / brochures in 16 zones across Tasmania. We can also organize your national campaign. 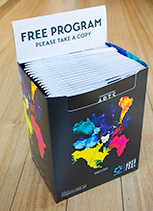 Friendly distributors: weekly runs in the major centres, dedicated display stands for brochures and a high degree of loyalty and support from the venues in which we display material. All this results in our client’s material being given optimum exposure for the lead in period of the campaign. Our service also includes the post event removal of material in the major centres to ensure that the displays remain up to date. This is great P.R. and very popular with all the venues that kindly support arts, events and community issues in Tasmania by allowing us advertising space on their site. We now offer a design service for print and web. Save the hassle of dealing with multiple providers by allowing us to Design, Print and Distribute your material. We can also design and build a web site to support your event along with hosting your site on our own servers. This saves you the time and hassle of setting it all up with a hosting company. • Attractive brochure display units in selected cafes and businesses. • The Eventful On Line Calendar for Arts, Entertainment and Events in Tasmania. • Free full listing for Stick em Up / Eventful clients. • Full page Promotion available - discounted for Stick em Up / Eventful clients. • Web / Graphic Design and Photographic service. Design - Posters / Fliers etc.